I figured that I would quickly post this one. I have been quite the slacker when it comes to blogging and figured that I might be motiviated if I get right on it. 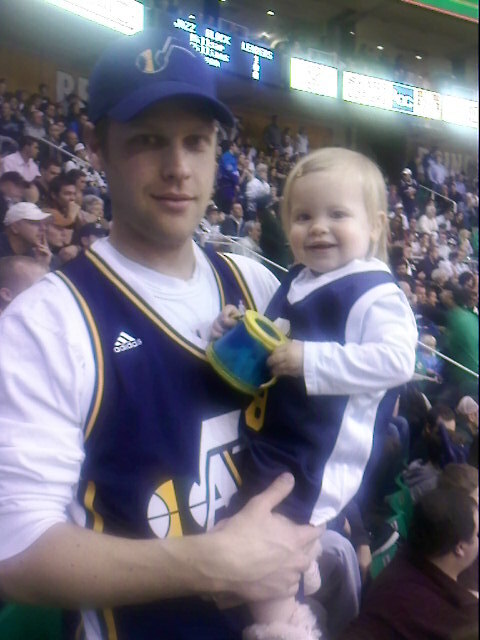 Last night we went to the Jazz game!! They played a fierce Miami Heat team, which have a line up stacked with superstars such as "King James," Dwyane Wade, and Chris Bosh. (This is just another one of those teams trying to buy themselves a chamionship) The Heat have been on a winning streak and we had hoped to squash their momentum, but instead fueled it. It looked like we might of had a chance to beat them in the beginning of the fourth quarter but they soon put that to rest. We had a great time anyway!! All I had with me was my phone camera so our pics turned out a little blurry. 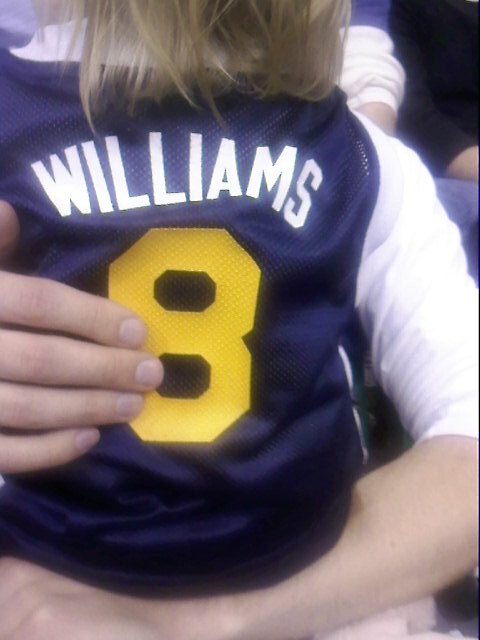 I got the little miss a jersey to match her daddy. Now I am the only one left with the old one:) I guess that is how it goes. As a mom you take care of everyone else first. ﻿Brooklyn always has a good time at the game. When I took her out to change her, she motioned for me to take her back in. She dances almost evertime the music plays and she likes to watch the Jazz dancers. Another funny thing she does these days is waves and says "hi" to complete strangers, whether we are at a Jazz game or the grocery store. The people around us were quite entertained with her "hi"s and "hi guys". We sat next to Trevor and Amanda. 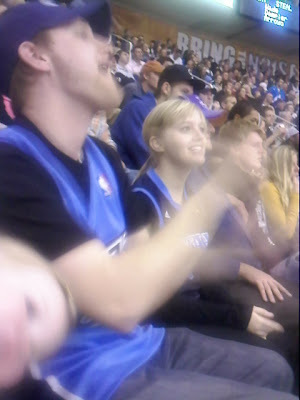 I caught ﻿Trev, in action, as he was air drumming with all his might trying to get on the jumbotron. We will be watching the next game at home. We never miss one(thanks to DVR)!! Actually for the last couple of months, my brother, Gareth, and sister-in-law, Anna, have been coming over every friday night to watch. We put the little B to bed and we all get to hang out. 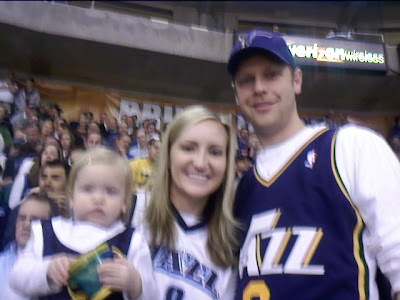 Good times, go Jazz!! how fun that you guys get to go so often! and Brooklyn's hair is getting so long! Hope your haveing a great holiday season so far! Go HEATS!!! Kidding, we like the jazz around here too! Brooklyn's hair is getting long. So fun you can take her to those kind of events. So is the picture at the top of your blog the latest trend in family picture taking, or was it a special request!? Brooklyn looked so cute at the game. I'm glad she had fun and was good for you! GO JAZZ!!!!! I noticed Brooklyn's hair too! It is getting way long. I love your nativity picture too!! What a neat experience!